I have been asked by a few commenters to give my thoughts on the tragic September 11th 2015 Mecca crane disaster, where a very large and heavy construction crane smashed into the Masjid al-Haram killing at least 107 pilgrims. Firstly, let me give my condolences to the families of the victims, and I sincerely lament this event, just as I will lament the Clock Tower attack when it occurs – which it will – as it will kill hundreds of thousands of pilgrims. I believe it may be planned for September 23rd 2015, which is the Islamic Eid al-Adha at the end of Hajj, and also just happens to be the Jewish Yom Kippur, which is the day that a regular Biblical Jubilee has to be declared. My first thought on this crane event however, was that this event was ritual in nature, for no other reason than it occurred on Sept 11th, and in the same location as I was expecting to see the next major New World Order false-flag terror attack. If it had happened on any other day of the year, I would consider it to be simply a horrible accident, but it was not any insignificant day, it was September 11th! The more I read about the tragedy, and the more video I watched of the weather phenomena that caused the event, the more I realized we may have just witnessed a bone fide prodigy from God, sent in order to warn both the world and the NWO elite. Was this event a prodigy indicating that the 2015 Hajj is to be the target of the planned NWO Clock Tower and Kaaba Attack? Is the planned day for the suggested attack September 23rd 2015, which is Eid al-Adha, and also Yom Kippur? Pay Attention To Weird Omens! PAY ATTENTION TO WEIRD OMENS! This is probably the best tonic against normalcy bias, which unfortunately has infected the vast majority of people, seemingly diminishing their situational awareness. 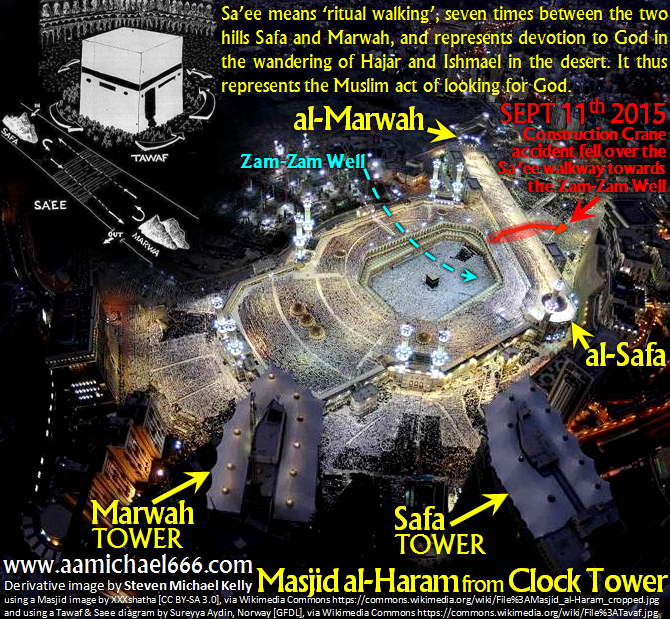 The crane fell towards the important Zam Zam well and Kaaba, and symbolically broke the Sa’ee walkway between the two hills Safa and Marwah as shown above. This could be quite symbolic for the Islamic faith, as this section of the Masjid al-Haram basically epitomized the search for God, and thus the story of the redemption of Ishmael and his mother Hajar. This could have been an entirely natural event (which I actually favor), or it could have been deliberately setup to happen, there is no way of knowing for sure. However, the date of September 11th 2015, is extremely ominous. Ask yourself if this event was in fact deliberate, then why is this date important, and why would the breaking of the Sa’ee walkway between the two ritual hills of al-Marwah and al-Safa, by a Saudi Binladen Group construction crane be ritually important? 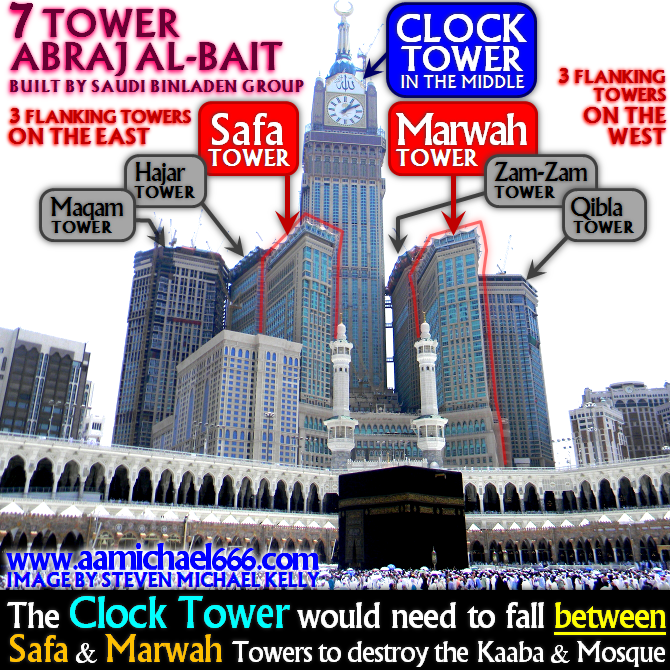 Note that if the Clock Tower which was built by the same Saudi Binladen Group was to fall forward onto the Kaaba and Mosque, it needs to fall directly between the gap left between Marwah Tower on the western flank, and Safa Tower on the eastern flank! I think not – Please pay attention! I discuss this event in more depth within this post.
! URGENT WARNING FOR SEPTEMBER 23rd 2015 !